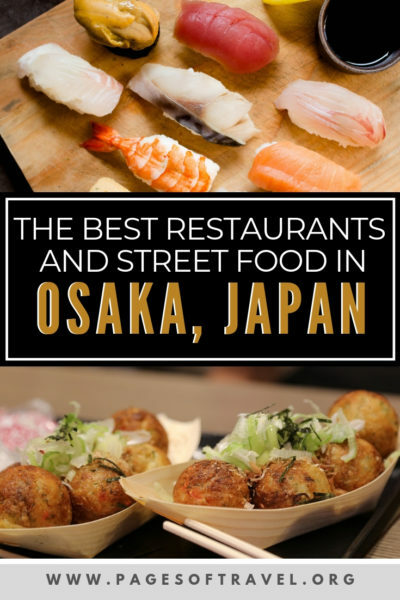 Osaka is a food lovers paradise. The second you get off the train after getting into the city you’ll instantly be greeted by the smells of alluring food stalls. The main action for grub is the Dotonbori street food, which we will cover in this post, but we will also cover what to eat in Osaka for first-timers or returning visitors too. First off, we’ve been to Osaka three times now and each time it gets better and better. We honestly NEVER tire of this city and feel comfortable aimlessly wandering around finding new places to add to our list of favorite Osaka restaurants and hidden attractions. 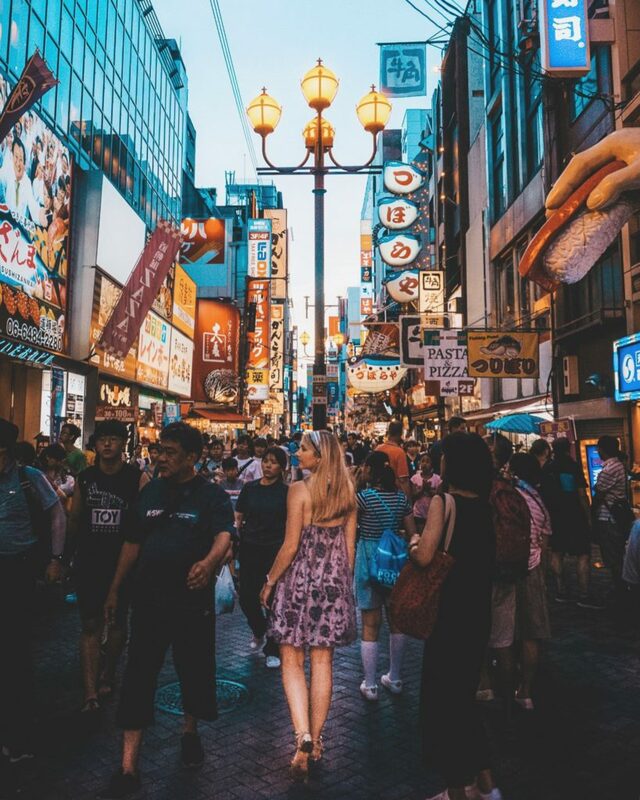 The vibrant nightlife, the romantic canals, the endless options of things to do and see, and of course, all of the many things to eat in Osaka are just a few on the list of things that make us feel right at home here. If you are looking for a complete Osaka itinerary, we’ve got you covered here. If you want some quick inspiration then hop over to our Instagram and take a peek at our Osaka photos and Osaka story archive for some “behind the scenes footage.” But for now, you’re probably wondering what to eat in Osaka still so let’s move on so we can all start dreaming about it together! Dotonbori is the main hub for the street food in Osaka and has some of the best restaurants in Osaka as well. 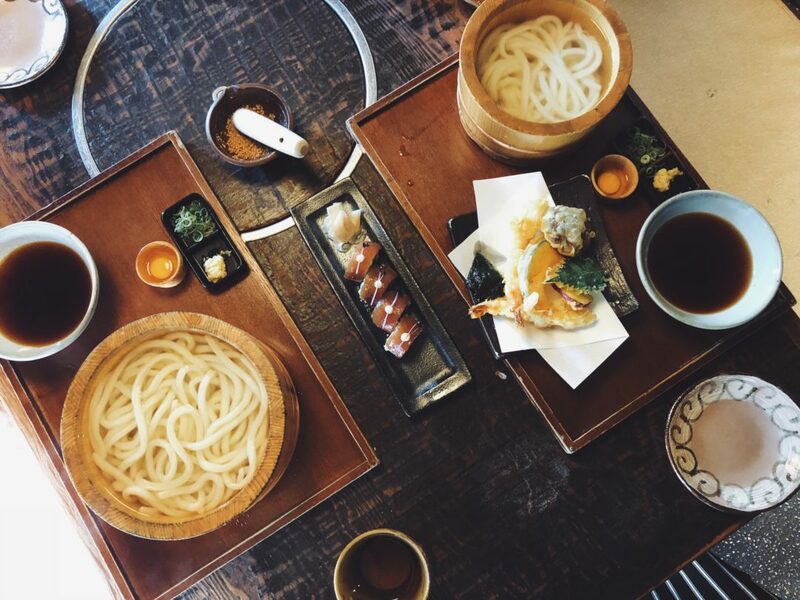 Everyone who visits Japan should experience these unique dishes for a number of reasons. Because it’s as fresh as it’s gonna get! 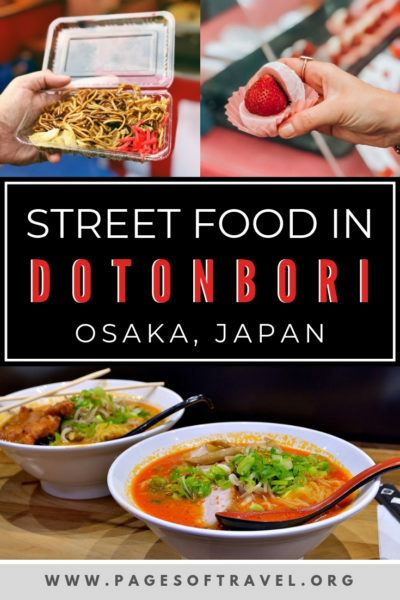 You can sample a variety of Dotonbori street food and make a meal out of it for low cost – perfect for those traveling to Osaka on a budget. 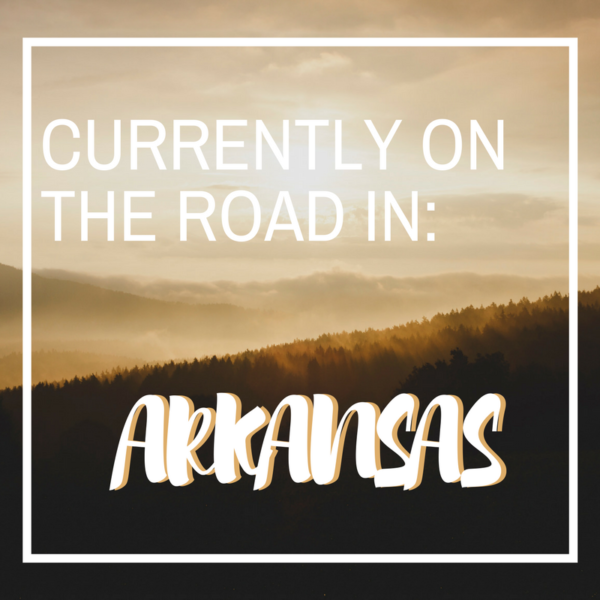 Now of course if you have specific dietary restrictions or are vegetarian or vegan, you’ll probably skip quite a few of these – but don’t worry, we’re going to cover other options too! Let’s start off with takoyaki – an Osaka specialty street food. 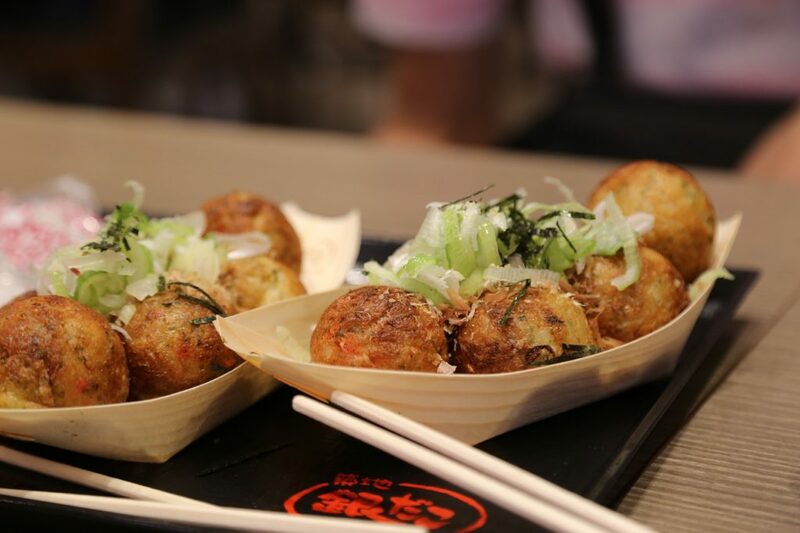 Takoyaki is a ball of fried dough that contains octopus, green onion, pickled ginger, and tempura scraps. After they come out of their special takoyaki mold they’re plated inside a to-go container (usually with six inside) covered in a special takoyaki sauce, and sometimes mayonnaise and bonito flakes. Creo-Ru is one of the best spots to try takoyaki in Osaka, the queue is usually long, but it moves quickly. But if you are in a hurry or don’t want to wait in a long line, almost any takoyaki stand in Dotonbori is good. 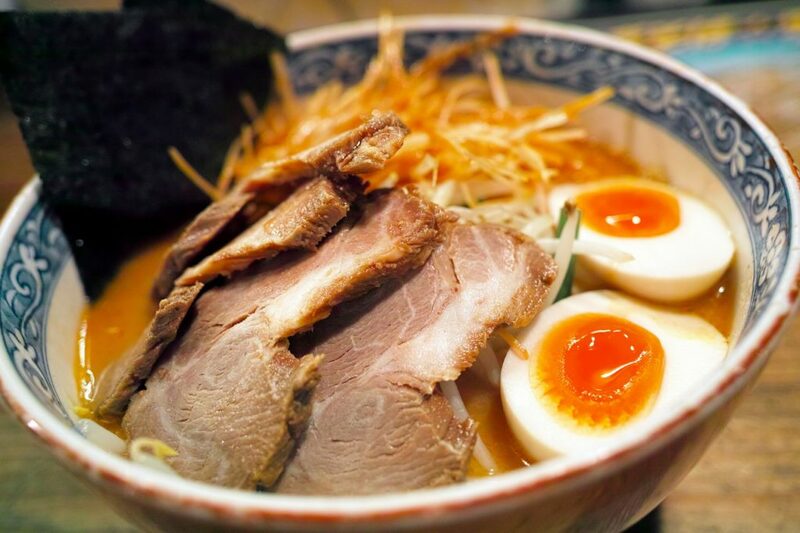 If you’re looking for the best ramen in Osaka the smells of Dotonbori’s ramen will immediately make you salivate. 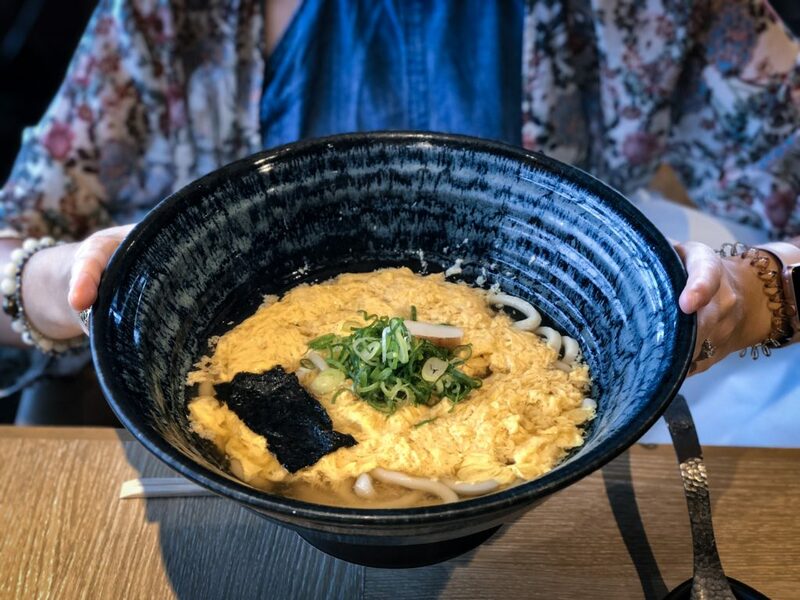 In Dotonbori you’ll see a bunch of ramen shops some with indoor seating, some with outdoor tables in a covered gazebo, and many with a vending machine that you’ll order your ramen from. Two of the most well-known and best ramen shops in this area are Ichiran Dotonbori Honkan or Kinryu Ramen Dotonbori. 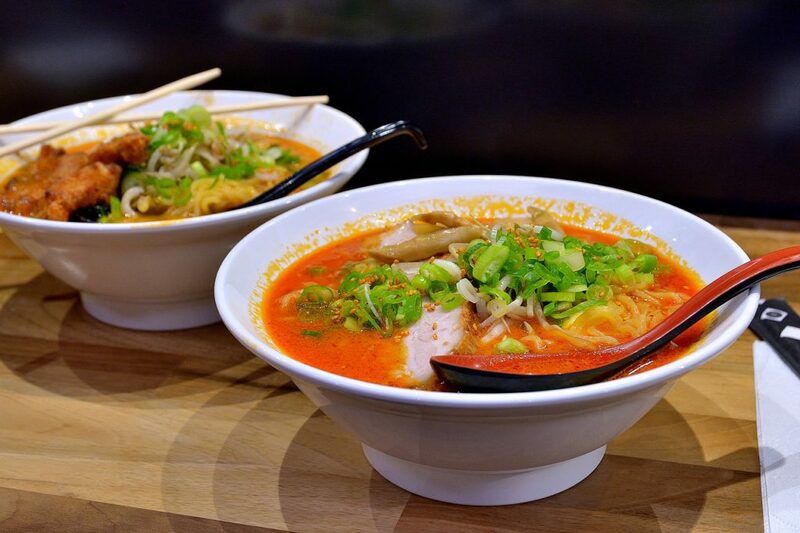 Either way, a bowl of fresh ramen is a comfort food that you should try at least once! In Japan there are A LOT of noodle dishes, but each one is entirely different from one another, yakisoba included. 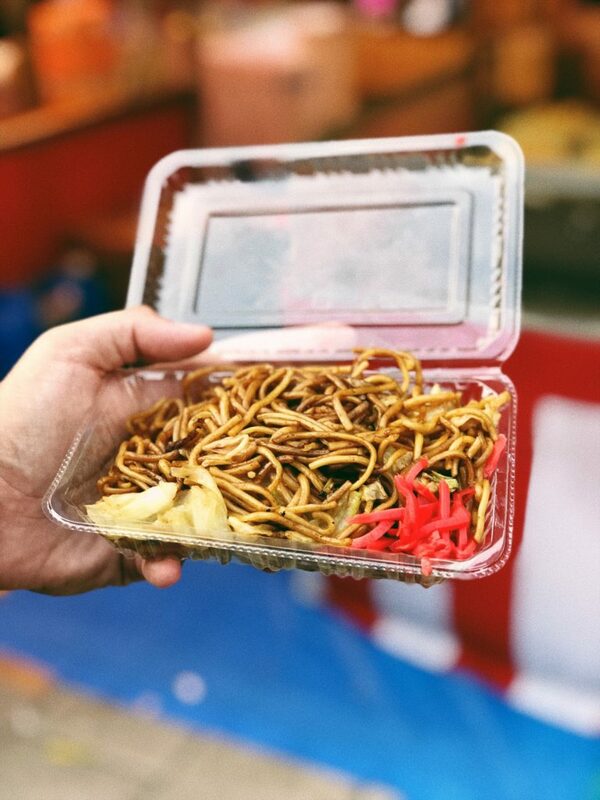 Yakisoba is a dish made of fried buckwheat (soba) noodles, a special yakisoba sauce, pork, and finely chopped vegetables usually including cabbage, bean sprouts, carrots, and onion. After it’s all fried together it is often garnished with pickled ginger. 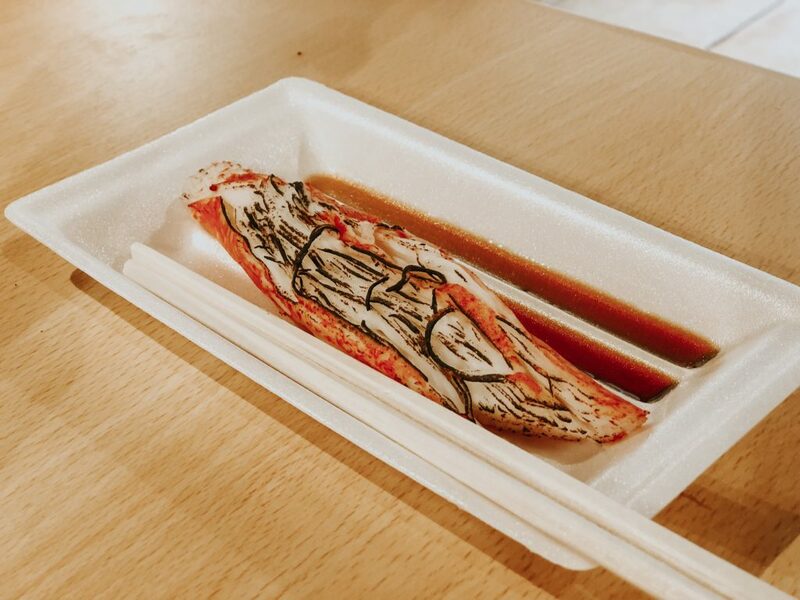 It’s a common street food that is widely available during festivals but can also be found as Dotonbori street food too! One of the Dotonbori street food dishes that we love and crave is okonomiyaki. 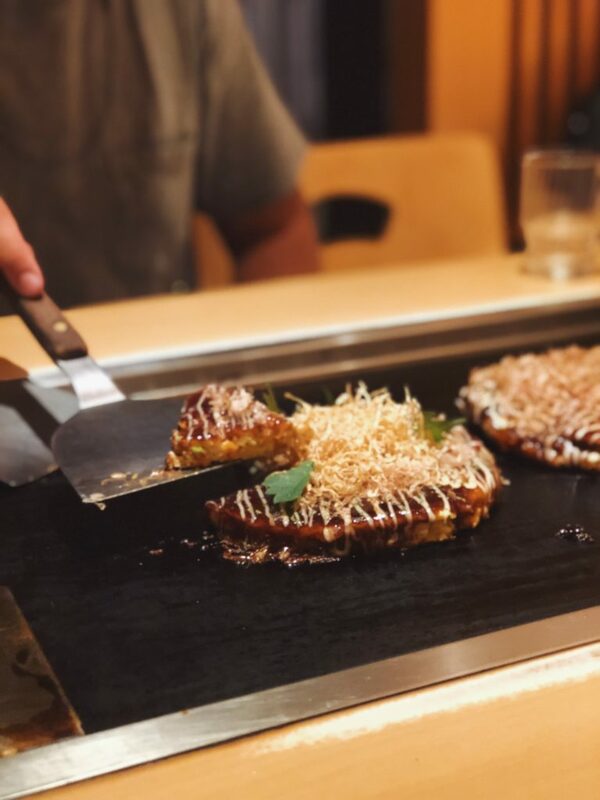 Okonomiyaki is a savory pancake that has a ton of ingredients – in fact, the name roughly means “how you like it cooked.” Usually, it contains a mix of cabbage, egg, meat, and other veggies. Then it’s mixed up into a “dough” and covered with okonomiyaki sauce, which is sweet and tangy, mayonnaise, and bonito flakes. We’ve had this in all different cities in Japan and have been surprised by how this dish varies by region. The most well-known okonomiyaki is in Hiroshima, but the Kansai region (including Osaka) has made its way too! 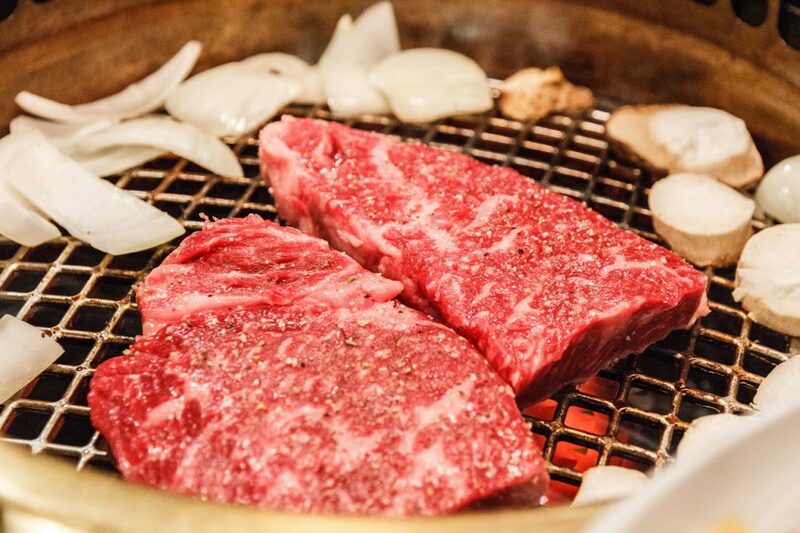 Yakiniku means “grilled meat” and this is something you’ll find allllllll over Japan. In a way, yakiniku is kind of like Japanese barbecue. Various kinds of meat are sliced thin, placed on skewers, covered in a sauce made of shoyu (soy), mirin, sake, garlic, ginger, and sesame. 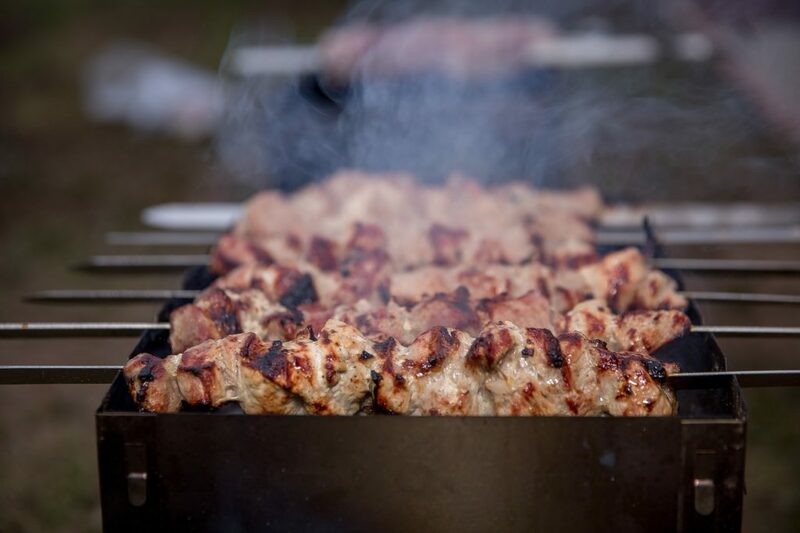 After dousing it up with the marinade, the skewers are then grilled over charcoal until cooked. There are places that you can buy individual skewers in Dotonbori, but there are also restaurants that specialize in prime cuts of meat such as Kobe, Wagyu and Matsuzaka beef where you can cook it yourself – but it comes with a heftier price tag (more on this later!). Similar to yakinku, kushikatsu is a dish of deep fried meat and vegetable skewers. This Osaka cheap eat is a well-loved and there are also many restaurants where you can cook your own kushikatsu as well, some are even all you can eat! 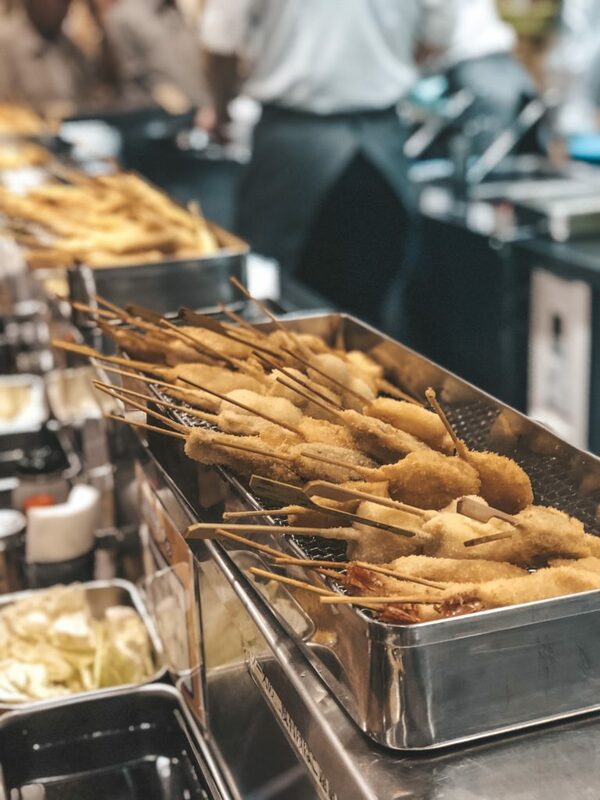 To cook your own kushikatsu, you will select your meats and veggies, batter it up, coat it in panko crumbs, and drop it delicately into the fryer! After a few minutes, it’s ready to be paired with your favorite dipping sauce and enjoyed. Traditionally a Chinese dish, gyoza is now found all around Japan, even in Konbini (convenience stores). These lightly pan-fried dumplings are a favorite of Logan’s and I love them too when a shrimp option is available. While I don’t know the name of the shop in Dotonbori, as soon as you see a giant plastic gyoza sign, you’ll know you’ve found the place. 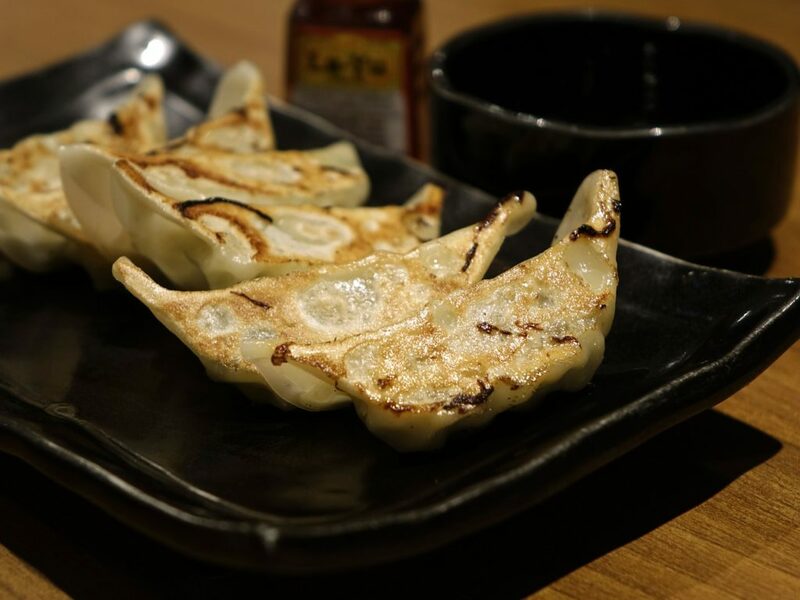 We’ve had really yummy gyoza in a few other cities, but this option is great for a quick Osaka cheap eat. Besides the Dotonbori street food there are a number of restaurants and markets that are incredible places to eat in Osaka. Here are a few of our tried and true favorites (most of them have English menus too!). We loveee sushi, because of that, we’re pretty picky about it too. 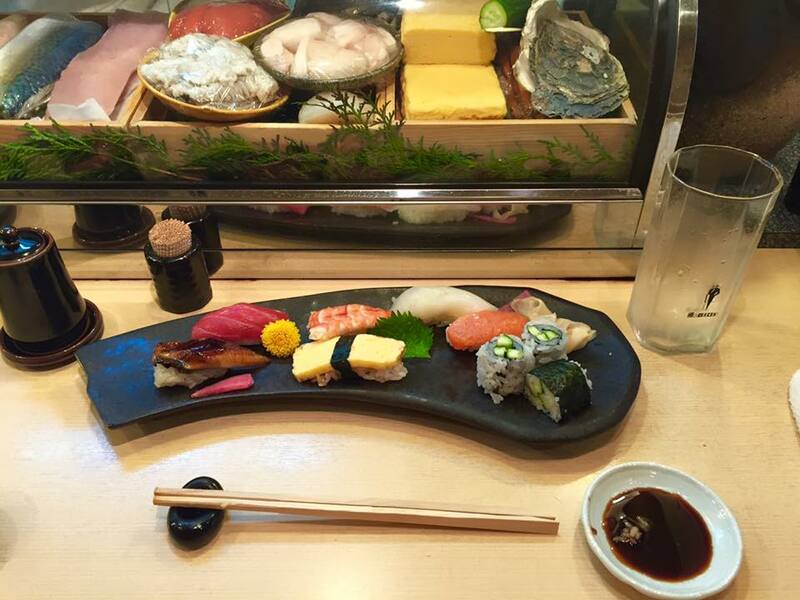 We’ve only been to Sushi Hayata once, but we found it to be really fresh, tasty, and had great service. The restaurant itself is rather small with bar seating and only a couple of small tables, but chefs get you in as fast as they can. If you are adventurous or willing to try something new, we recommend getting their daily rotating special set. Ours came with a variety of nigiri sushi including salmon, eel, fatty tuna, squid, and shrimp. 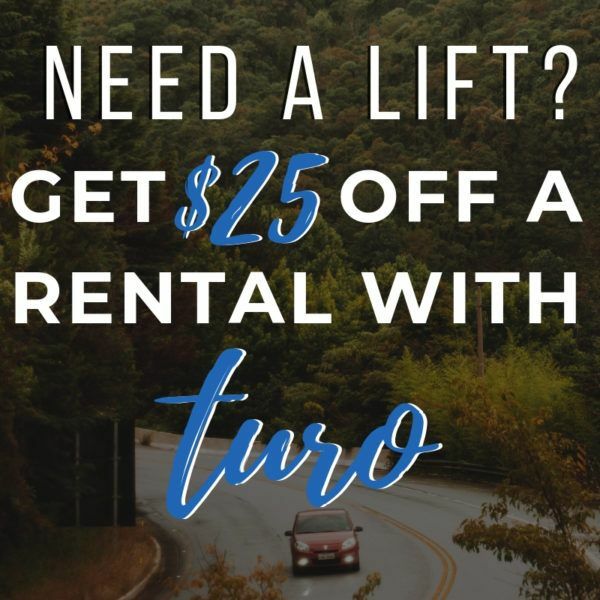 If you want to be a little more selective that’s okay too – they have an a la carte menu you can choose from! We could go on about Tsurutontan Soemoncho for days. Just thinking about it honestly has me drooling. Tsurutontan Soemoncho actually has a few different locations in Japan, most being in Tokyo, but just because there isn’t just ONE doesn’t mean you should steer clear. They have some of the best and most diverse udon entrees you’ll find. 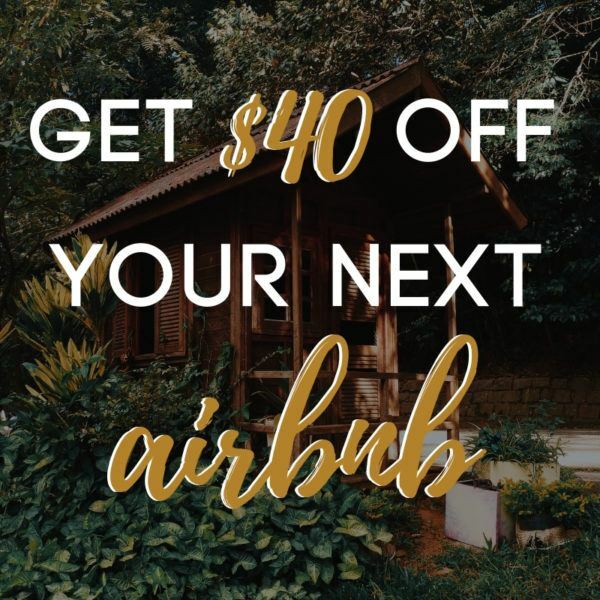 Plus you can order a double or triple order of noodles for NO EXTRA COST. Every noodle lovers dream, am I right? If udon isn’t your thing they also have sushi and steak entrees too. If you do decide to dine here pop in for dinner right after sunset. 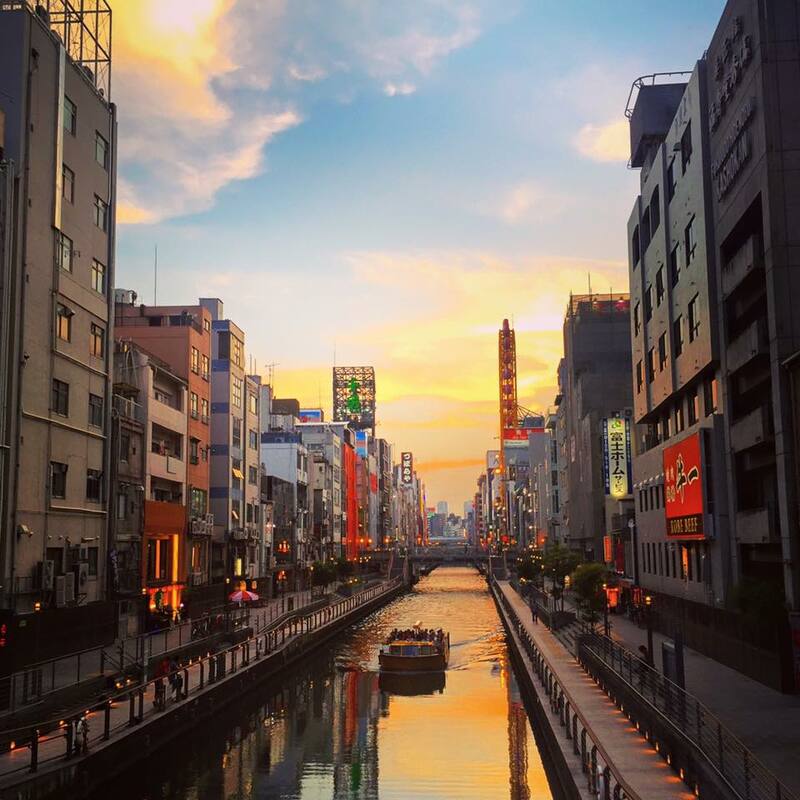 It’s located right on the Dotonbori canal which we believe has one of the best city sunsets in the world. Chances are if you’re in Dotonbori or near Tsutenkaku Tower you’re gonna see a ton of kushikatsu restaurants. Kushikatsu Daruma is all over Osaka with locations in Shinsaibashi, Dotonbori, Namba and more. At this particular kushikatsu restaurant you will select the items you would like off of a menu then those items will be prepare for you. If you prefer to go to a place where you can enjoy all you can eat kushikatsu plus cook it yourself, we suggest Kushiya Monogatari. If you’re looking for some of the best ramen in Osaka these two are some of the most popular in Dotonbori (we briefly mentioned them above). Ichiran Dotonbori Honkan is a chain ramen shop but it is incredibly well-known for its creamy soup broth and extra thin ramen noodles. On the other hand, Kinryu Ramen Dotonbori is another popular ramen shop in Osaka, but it has a shoyu (soy sauce) based broth and more topping choices. Remember that pricey yakiniku I was telling you about? Here it is. Matsuzakagyu Yakiniku M offers a unique culinary experience where you can choose your own cuts of Matsuzaka beef and cook it yourself. It’s not cheap but if you’re wanting to try some of Japan’s finest steak, this is a meal worth savoring and splurging on. I actually don’t eat beef but Logan said it was one of the best steak he’s had (right after the Grade A Kobe steak he had in Kobe of course). Instead, I had fresh prawns which I grilled tableside as well. If you are familiar with the food markets in Japan you’ve probably heard of Nishiki Market in Kyoto. Kuromon Market in Osaka is very similar and while it does feel a bit touristy, you can try a selection of different fresh foods and sweets here for pretty cheap! We got some grilled king crab legs for only 100 yen which was a crazy steal! 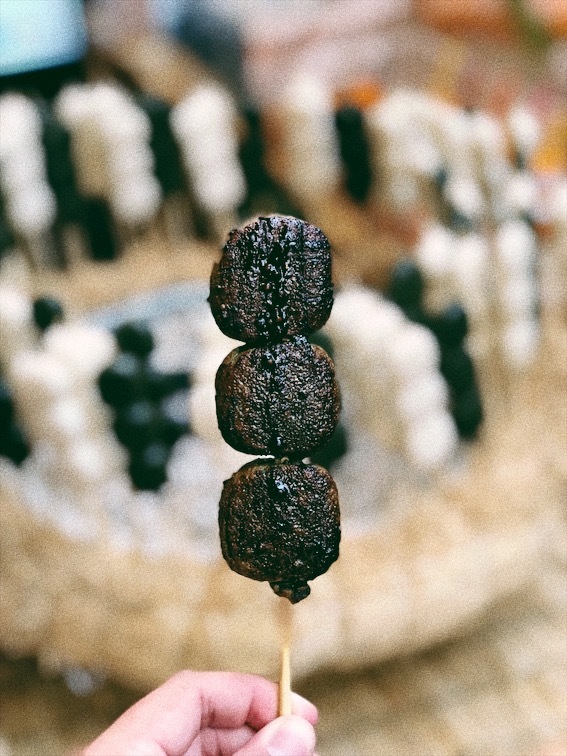 We also recommend trying the grilled dango here – it’s different from many other places as the sticky rice flour balls are coated in a sweet and savory soy sauce glaze and roasted by fire. Other recommendations include the grilled eel, tofu donuts, and strawberry daifuku! 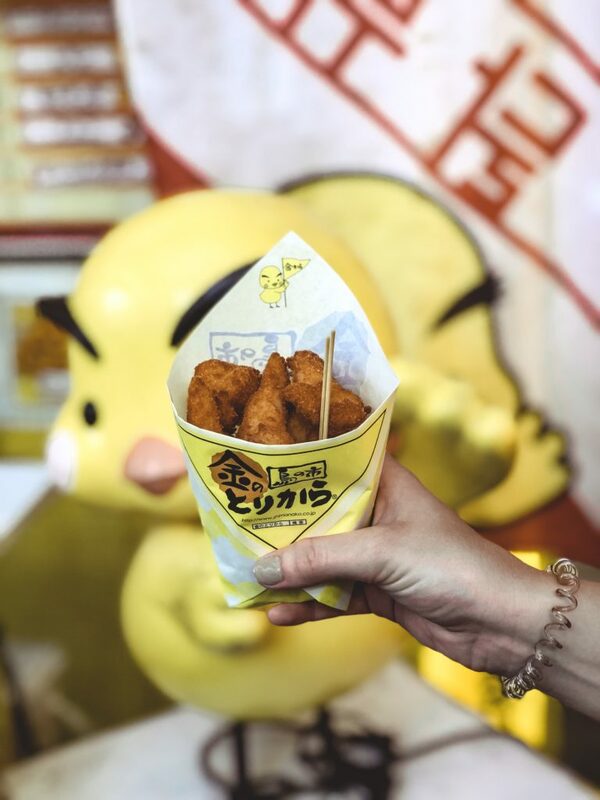 While Kinnotorikara technically falls under our list of Dotonbori street foods we threw it in the restaurant category cause it’s not on the “main street” and because we keep going back for more (I’m not joking, we’ve eaten these little chicken nuggets a total of four times). Kinnotorikara is super cheap (around 200 yen for a single order! ), made right in front of you, and there are a TON of different sauces you can pour right on each piece. Pop over across the street for a drink from the vending machine and enjoy these piping hot pieces of fried chicken. While neither of us are strict vegans or vegetarians right now, I was a vegetarian for a number of years (I still don’t eat any red meat) and typically still eat a lot of vegetarian or plant-based meals. One way you can find vegan or vegetarian restaurants in Osaka is by using the website Happy Cow. I was pleasantly surprised by the number of places in Osaka that have vegan or vegetarian options. There are also a number of vegetarian or vegan-friendly options at most konbini too! If there’s one thing to know about Logan and I is that we LOVE sweets. I mean we seriously have an entire Instagram story archive on all the ice cream we ate while in Japan. 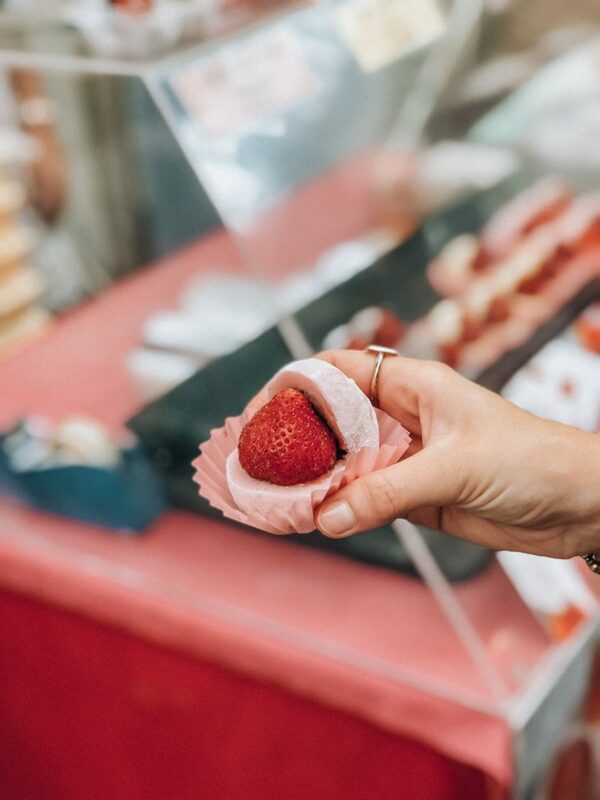 Osaka has some great restaurants or food stalls that are solely dedicated to delicious Osaka desserts so if you’re looking to indulge we can help with that. One of the wildest Osaka desserts we ate was PANBO. 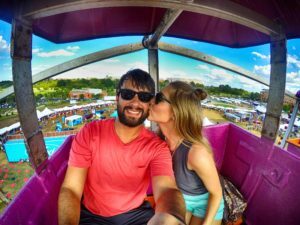 It’s not that it’s incredibly ingenious but it definitely made us say “WHY HASN’T ANYONE ELSE THOUGHT OF THIS?!”. 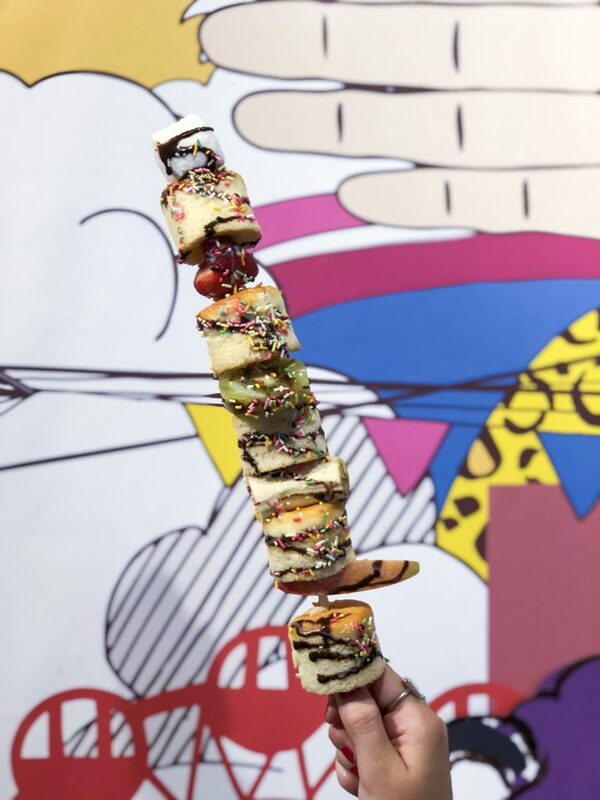 PANBO is a small shop that has skewers of mini pancakes, fruit, and marshmallows. The best part about it is you can add as many toppings as you want so drizzle on that chocolate syrup, shake those sprinkles, and bathe each morsel in sweetened condensed milk if you want. 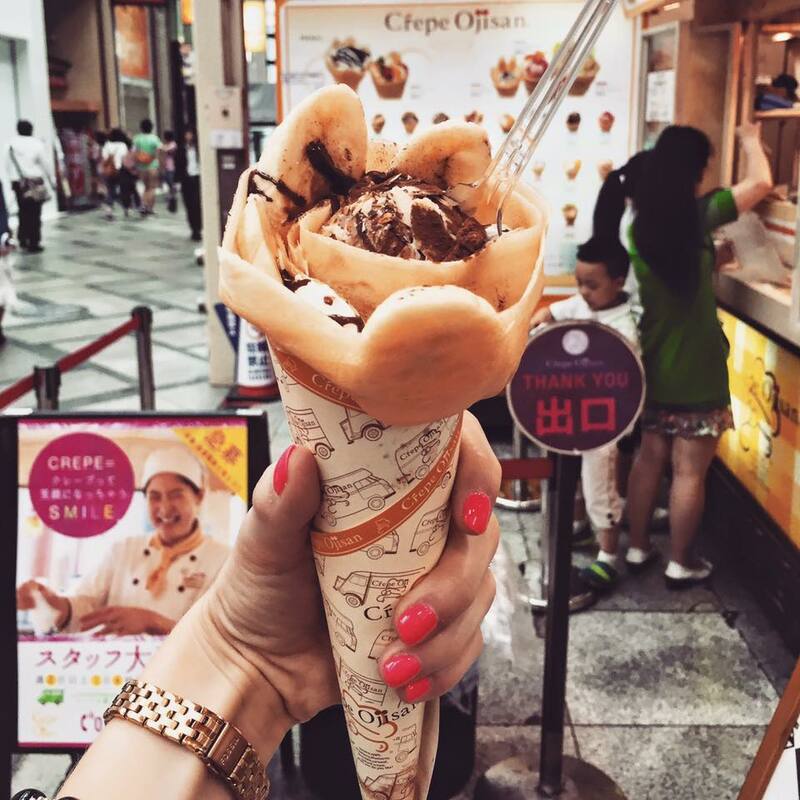 Japanese crepes are unlike any others we’ve had, mostly because they are super #extra. I’m not kidding, they put more sugar in them than a level of Candy Crush. But somehow even though they might have an entire slice of cheesecake, scoops of ice cream, whipped cream, and other toppings inside, you can still manage to eat the whole dang thing. Crepe Ojisan Shinsaibashi is our favorite crepe stand in Osaka and is worth sharing with a pal, kid, or significant other but we definitely won’t judge you if you decide to eat the whole thing by yourself (we did). Have you heard of Japanese cheesecake? Before you ask, nope it’s not anything like the New York style cheesecake. 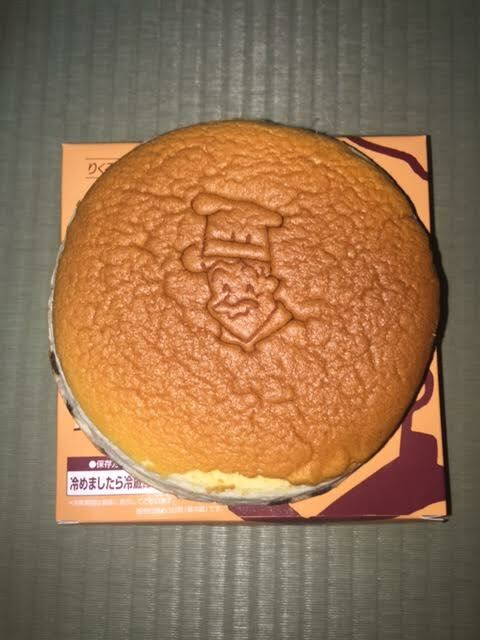 If NY style cheesecake and a sponge cake had a baby, it would be Japanese cheesecake. At least that’s the best way I can describe it. It’s light, fluffy, and you’ll definitely want to try one at Rikuro Ojisan no Mise. If you go into it with the mindset that it’s not going to taste like the cheesecake you’re used to having, you’ll probably love it. You’ll end up buying the whole cheesecake but it’s only around 700 yen. 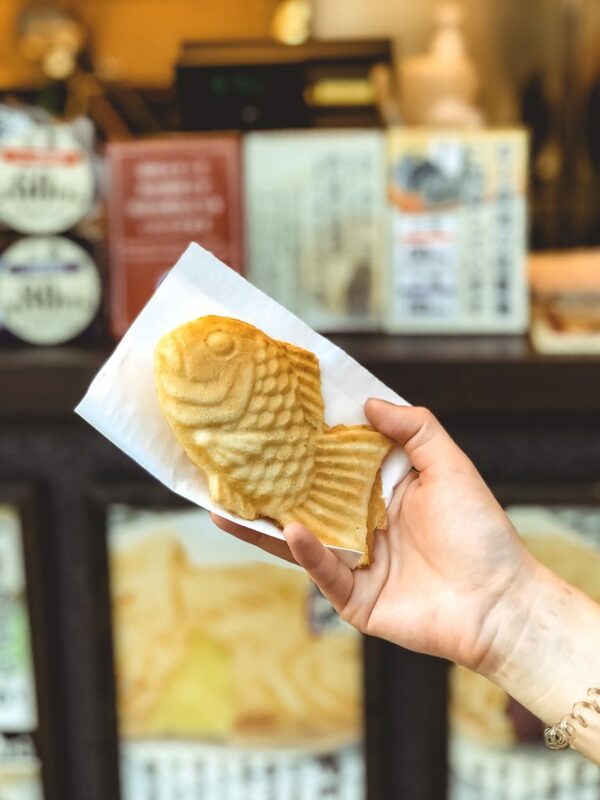 Taiyaki is a Japanese dessert cake that is shaped like a fish. It resembles the Tai (Japanese Red Seabream). The most common filling is red bean paste but we’ve also had it with sweet potato or custard. If you decided to get only one treat while in Osaka, let it be one of these! Well now I’m hungry and I wish I could find some okonomiyaki here in the United States, but I think I’ll have to keep that craving until next time we’re in Osaka.